2017, Paolini M. et al. Nano Publications > Publications > Miscellaneous > 2017 – A new opportunity for nanomedicines – Paolini et al. Nanomedicines are mainly used as drug delivery systems; here we evaluate a new application – to inhibit a drug’s metabolism thereby enhancing its effective dose. 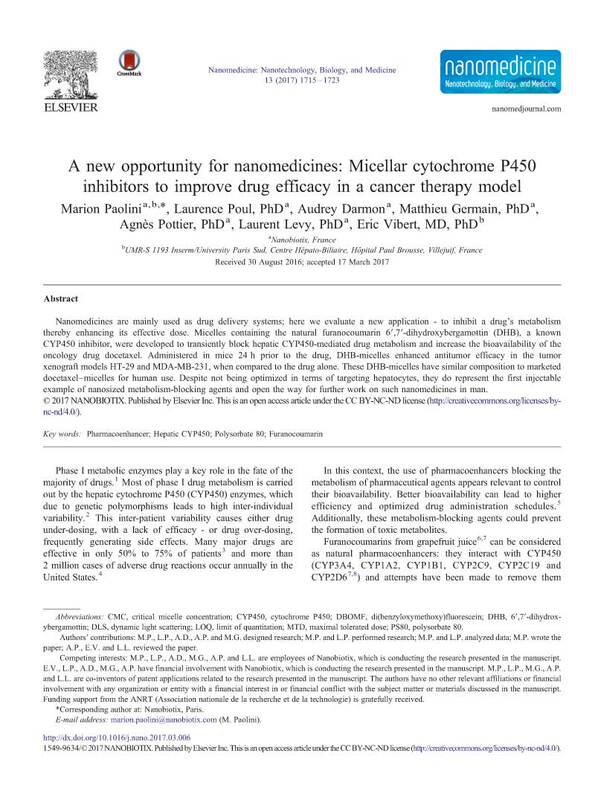 Micelles containing the natural furanocoumarin 6′,7′ dihydroxybergamottin (DHB), a known CYP450 inhibitor, were developed to transiently block hepatic CYP450-mediated drug metabolism and increase the bioavailability of the oncology drug docetaxel. Administered in mice 24 h prior to the drug, DHB-micelles enhanced antitumor efficacy in the tumor xenograft models HT-29 and MDA-MB-231, when compared to the drug alone. These DHB-micelles have similar composition to marketed docetaxel–micelles for human use. Despite not being optimized in terms of targeting hepatocytes, they do represent the first injectable example of nanosized metabolism-blocking agents and open the way for further work on such nanomedicines in man.